Your print buyers need their jobs printed fast, they need it produced at a low cost, and they need consistently high print quality. Presstek can help. 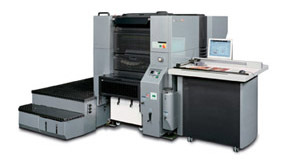 Our 52DI 4-color digital offset press is among the most efficient, productive and profitable printing systems on the market. Owning a DI results in a streamlined print production due to automation, fast on-press imaging and print speeds, and the total elimination of CTP systems. The Presstek DI's waterless printing design results in less waste, a wider color gamut, less dot gain, and enables you to get up to color fast so you don't have to waste time with unnecessary adjustments. You're saving time and resources without any compromises. Presstek's patented thermal laser imaging technology means you don't have to worry about costly click charges or hazardous plate processing chemistry. With a Presstek 52DI, 4 spools of media are inserted into the press, then automatically tensioned, imaged, cleaned and advanced so you don't have to swap out media for 44 jobs! The Presstek DI press integrates seamlessly into Macintosh and Windows workflows. Files are RIP'ed directly to the press; text, images and imposition can be checked on the DI’s on-press monitor or by using a hardcopy proofing solution. Presstek's DI imaging technology, combined with a central impression cylinder and single gripper system result in precise registration every time. When you add ECO-UV to your DI press, you're on a path to even greater success. ECO-UV enables you to print on more substrates, turn jobs around faster because of instant curing, plus you'll save on energy costs compared to standard UV. 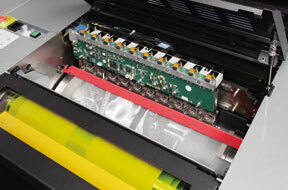 Presstek's ECO-UV curing system for DI presses increases the range of materials that can be printed, increasing your value as a print service provider. You'll be able to easily print on plastics and vinyl in addition to traditional paper and board. Learn how RND Signs is achieving success with a 52DI ECO-UV!